Soundtoys has teamed up with Burlington, VT-based musician/curator Greg Davis to present the SIGNALS experimental music series. 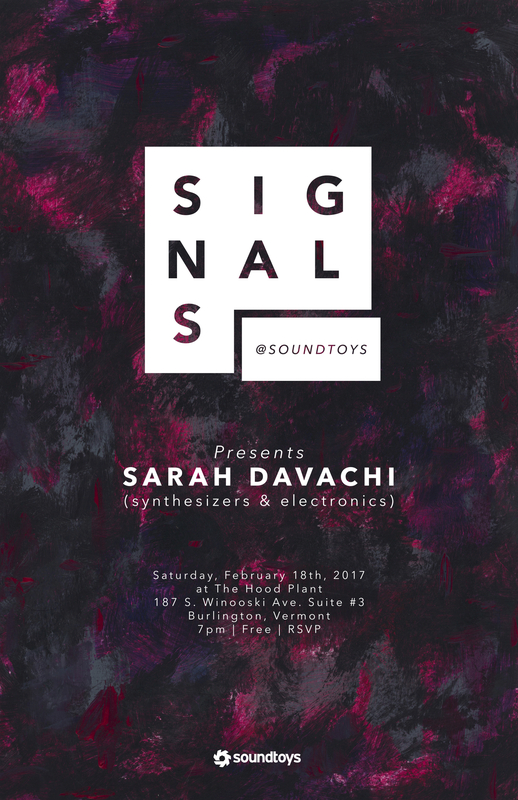 The third installment will be on Saturday, February 18th, 2017 with Canadian musician Sarah Davachi. This event is free to attend, but space will be limited. Please click here to RSVP. Sarah Davachi (b. 1987, Calgary, Canada) holds a bachelor’s degree in philosophy from the University of Calgary, and a master’s degree in electronic music and recording media from Mills College in Oakland, California. As a composer of electronic and electroacoustic music, Davachi’s compositional projects are primarily concerned with disclosing the antiquated instruments and forgotten sonics of a bygone era in analog synthesis, with concurrent treatment of acoustic sources – particularly organ, piano, strings, and woodwinds – often involving de-familiarization through processing. Her work considers the experience of enveloped sonic dwelling, utilizing extended durations, psychoacoustic manipulations, and simple harmonic structures that emphasize variations in overtone complexity and natural phasing patterns. Her work as a music researcher concerns aspects of experimentalism, organology and archival study, and phenomenology and perception, and has been published and presented within Canada, the United States, and the United Kingdom. Since 2007, Davachi has also had the unique opportunity to work for the National Music Centre (formerly Cantos Music Foundation) in Calgary as an interpreter, content developer, and archivist of their collection of acoustic and electronic keyboard instruments. Additionally, she has worked for the Western Front in Vancouver as an assistant in archival audio digitization, and has lectured at Simon Fraser University and Vancouver Film School. She has held artist residencies at The Banff Centre for the Arts (Banff, Canada), STEIM (Amsterdam, Netherlands), WORM (Rotterdam, Netherlands), EMS (Stockholm, Sweden), and OBORO (Montréal, Canada), and is the recipient of grants from the Canada Council for the Arts, the Alberta Foundation for the Arts, and SOCAN. Davachi currently resides between Vancouver, BC, Canada and Montréal, QC, Canada. You can stream Sarah’s music here. Scott Hansen of Tycho discusses inspiration, gear, production techniques, and using Soundtoys plug-ins in his creative workflow.